he EPIA Conference on Artificial Intelligence is a well-established European conference in the field of AI. The 19th edition, EPIA 2019, will take place in Vila Real in September 3th-6th, 2019. As in previous editions, this international conference is hosted with the patronage of the Portuguese Association for Artificial Intelligence (APPIA). The purpose of this conference is to promote research in all areas of Artificial Intelligence (AI), covering both theoretical/foundational issues and applications, and the scientific exchange among researchers, engineers and practitioners in related disciplines. EPIA 2019 will feature a set of thematic tracks (to be announced), covering a wide spectrum of AI topics. We are looking forward to welcome you and provide an excellent stay in this beautiful region! MVML’19 is now accepting papers on the following topics. 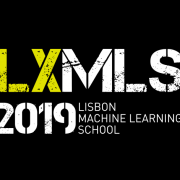 LxMLS 2019 will take place July 11th to July 18th at Instituto Superior Técnico (IST), a leading Engineering and Science school in Portugal. It is organized jointly by IST, the Instituto de Telecomunicações, the Instituto de Engenharia de Sistemas e Computadores, Investigação e Desenvolvimento em Lisboa (INESC-ID), Unbabel, Priberam Labs and Feedzai. 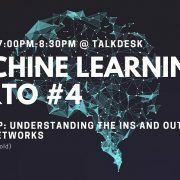 On the 30th of April, Diogo Pinto will guide us on how to build a neural network from scratch. The workshop will be divided in two parts, the first covering the theory and maths behind backprop and neural networks, and the second implementing and evaluating the neural network. Bring your laptops with a pre-installed Python environment containing Numpy and Jupyter Notebooks, and a notebook to take notes and make the necessary calculations! Diogo was trained as a Software Engineer at FEUP and grown into a Data Scientist generalist. He has mostly worked in fintech, namely in insurance, fraud detection, and more recently in the crypto-economy. His current interests are explainability, privacy and ethics in AI, and the blockchain technology.